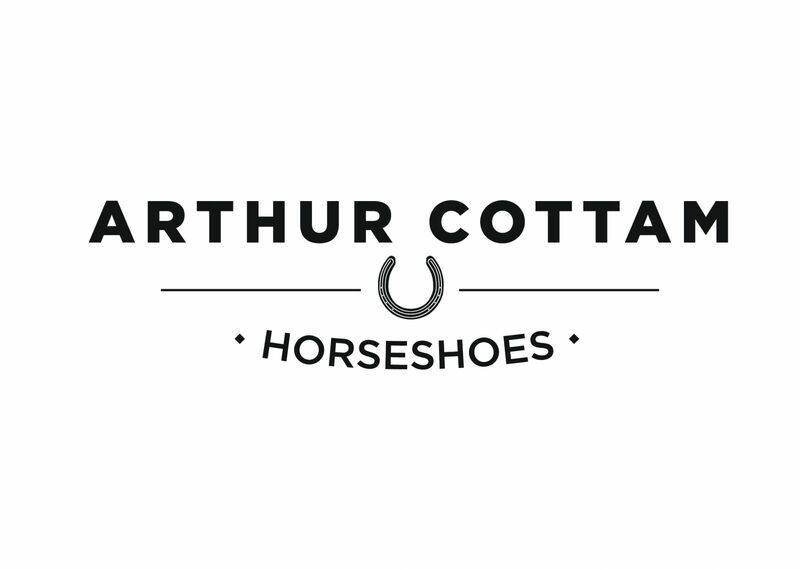 Arthur Cottam & Company (Horseshoes) Ltd was established in 1926 and is still an independently 5th generation British family owned horseshoe manufacturer and distributor of farrier supplies within the UK and Worldwide. Specializing in our own brand of Concave shoes, Steel Training shoes, Traditional, Ideal and Essential. We also have our own design of drop forged shoes, The Equishoe, which now includes Economy, Original, QC, Roller Lite, Trainers, Ultimates and XL. We also have our own range of Aluminium Racing Plate, Tools and Hoofcare Products including many other brands of farriery equipment. Other quality brands we stock include Handmade, MNC, Werkman, Pegasus, Imprint, March, Derby, Mondial, Mustad, GE, Save Edge, Heller Legend plus many others. BRAND NEW for August 2013 - buy online!! Unit 1 Moor View Ind. Est. This stunning Jewellery collection makes perfect gifts for any occasion. Designed and handcrafted by a master farrier using classic patterns, but with a stylish contemporary twist. Available in hallmarked sterling silver or 14 caret gold. These authentic miniaturised horseshoes & horseshoe nails are available as cufflinks, rings, lapel pins, bracelets, necklaces, and earrings. Existing pieces can be customised to your own requirements. Any style of shoe can be combined with almost any piece. Precious stones of your choice can also be inset. Please call to discuss your requirements. Atlantic Equine Ltd is the importer and UK distributor for a family of high quality farriery and hoofcare products. These include Victory aluminium racing plates, the Elite aluminium competition shoe, Mondial horseshoe nails, Equilox and Hoof Life hoof repair and adhesive, the Soundhorse range of glue-on shoes, Vallorbe Swiss rasps, Double S knives and Hoof Shield and TrueFlite pads. Orders can be placed online, by mail order or by visiting our warehouse. A new range of farrier products from Derek Gardner AWCF; a highly regarded farriers amongst his peers as exceptionally talented and renowned for his world class range of tools. Over 25 years, we have the greatest understanding of the risks and requirements of working farriers and their families. Based on our experience and your continuing input, schemes are specifically designed to cover your professional risks and liabilities. Your income protection needs in the event you are unable to work following accident, illness or injury. Our full time dedicated team is always available to discuss your needs with you. When claims are made, we understand what is required, reducing your time and paperwork. We know your needs from apprenticeship to retirement. Authorised and regulated by the Financial Conduct Authority, no. 125531. Handmade Shoes prides itself on manufacturing some of the highest quality horseshoes on the market as well as representing and sourcing products from some of the world's best toolmakers and manufacturers. Handmade Shoes has the largest range of quality farriery tools in Europe and possibly the world - and it continues to grow! Based in the UK, incorporating an excellent technical customer service team, Handmade Shoes have an established and efficient supply and distribution network across the world. With a vast range of high quality products sourced to meet individual farrier's needs – Handmade provides everything you need to be a farrier. Imprint Equine Foot Care produce a large range of mouldable plastic therapeutic horseshoes including Imprint First, the market leading shoe for the treatment of laminitis, Imprint Sport for the performance horse and the versatile Imprint Granules for hoof repairs, reconstruction and shoe modifications. We also run training courses, seminars and demonstrations for farriers and veterinarians, if you would like information on future events or details on our products do contact us. Kidwells Law Solicitors, based in Hereford, is a Law Society Lexcel accredited, dynamic firm of solicitors. We combine local presence with city professionalism and bring a fresh approach to the business of law. Kidwells run a ground-up modern legal practice, offering a full range of legal services that have specialist departments in each category of law namely: Employment and HR, Company and Commercial, Debt recovery, Litigation, Dispute Resolution and Mediation, Wills, Trusts and Probate, Family Law, Criminal Law and Military Law. We excel in the most complex and dynamic law arenas, but you’ll find we really care about even the smallest case – our aim is always to exceed your expectations. We are offering a 10% discount on any employment matter to those coming through the Forge & Farrier Industry Suppliers Directory. Please quote KS010. Life Data Labs, Inc. is a US manufacturer of equine nutrition and topical hoof care products. Established over thirty years, the ISO 9001:2008 certified company is recognized worldwide as an icon of quality equine products. Life Data® Labs is a certified ‘GM Free’ production facility. Farrier’s Formula® has been a trusted name in the EU market for eighteen years. Although Life Data® Labs made its mark on the equine world with hoof supplements; the company’s newest hoof topical has now gained the attention of professional farriers. Life Data® Hoof Clay is a non-caustic hoof packing that is natural, easy to handle, and can safely be applied with your bare hands. It uses a blend of ingredients that will not burn or destroy tissue, and stays within existing wall cracks, wall defects, old nail holes, and hoof wall separations for extended periods of time. Iodine and tea tree oil are ingredients that give the product its unique properties. Comprehensive choice of shoes from aluminium plates to heavies, Brand name tools and accessories. Suppliers of quality horseshoes and horseshoe nails, designed by Farriers for Farriers. Our exclusive products include brands such as Vulcan Horseshoes and Nails, GP Nails and Tools and Malaysian Horseshoes. With over 35 years’ experience in Nutritional Advanced Formulations and manufacture, renowned not only for our products but our passion for horses everywhere. NAF specialise in complex nutritional formulations which include a range of targeted ingredients to work in synergy together to give you the ultimate five star treatment and support where required. PROFEET has been designed by farriers for farriers. Designed to give you the hoof you need for each visit to ensure your customer is sat on five star hooves everyday. With a unique complex of ingredients to promote healthy horn growth from the inside out, available in pellet, liquid or powder form and veterinary approved. Give your customers Five Star hoof treatment, Feed PROFEET. 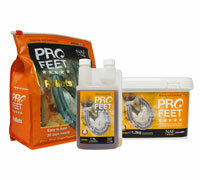 What’s more PROFEET has their popular applications to provide essential external support from PROFEET Rock Hard which targets soft soles and really disinfects those frogs prone to bacterial and fungal attack, to, the ever popular PROFEET Hoof Moist that ensures the moisture fluctuations in the horn are sustained without proving detrimental to horn health. 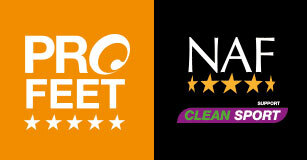 Complete your Five Star hoof care, ensure you have the forth team member, ensure you have PROFEET. For you, for your customer, for their horse. With over 15 years of farriery experience, our aim was to create the finest chaps that money can buy. To bring the farriers apron into the twenty first century. 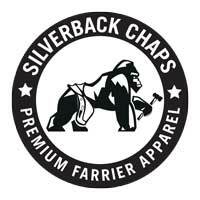 Since 2007, Silverback Chaps have worked tirelessly to create the worlds greatest chaps. In September 2011, we finally created the most comfortable and ergonomic pair of chaps on the market. With the innovative abdominal sling, dorsal support and bi-lateral fastening system, these unique patented design aspects allow a perfect fit every time, avoiding undue stress and injury. Our outstanding, high quality materials make these chaps some of the lightest on the market, with ultimate protection, creating a core stabilizing system along with a great pair of chaps. All our materials are sourced within the UK and most importantly all our chaps are made in the UK. 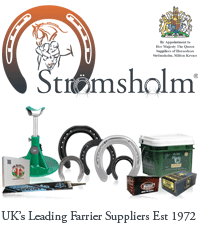 Farrier Tools, Supplies and Equipment by Stromsholm Ltd, Milton Keynes, UK. We are proud providers of horseshoes and farriery tools, supplies and equipment, by appointment to Her Majesty Queen Elizabeth II. Browse our shop online for an excellent range of farrier tools such as hoof nippers, rasps, testers, hoofjacks and more. We also provide farrier supplies and sundries such as Smithy Coke, Horseshoe Nails, Feed suppliments and more. All of our Farriery equipment is of the highest standard, as you would expect from a company responsible for supplying the royal family's Equestrian needs. Our comprehensive range of horseshoes is complimented with an extended range of tools and equipment required by today’s professional farrier. Our products also include many of the leading hoof care products available on the market today. SWAN PRODUCTS has manufactured Portable Forges for over 20 years. Our entire range is suited to both Farriers and Blacksmiths alike. We also stock a huge range of Tools & Equipment as well as being a stockist for Stromsholm UK. Address: Units 1 & 2 Gamma, Orchard Trading Estate, Toddington, Gloucestershire GL54 5EB. Total Foot Protection (TFP) aims to be at the forefront of Farriery innovation and has a reputation for bringing specialist products to market within the UK and Europe. Over the years TFP has been an industry leader and either sourced or designed various products including the Equine Digit Support System, Steward Clogs, Styrofoam Support System, Equisoft Support System, Performance Leverage Reduction (PLR) aluminium Shoes, Kross Check Leverage Testing Device and the latest innovation the Avanti Steel PLR Shoe to the farriery industry. TFP prides itself with its customer service and having friendly and knowledgeable staff who are all just a phone call away and are determined to make purchasing and sourcing products a seamless experience for Farriers. As well as reputation for specialist products, TFP also stocks all the main brands of Shoes, Nails and ancillary products including the Kerckhaert range, Graduated Hinds, Jim Blurton, Blenkinsop, Mustad nails, Vulcan, Vettec, Fitzwygram, Dallmer to name just a few. Making us a great one stop shop for your daily needs and our staff are always up for a challenge to source those hard to find products. Add onto this our extensive home and worldwide event program, TFP is leading the way in farriery innovation.